…bring a national political convention to Cleveland. Eight years, three bids, a downtown renaissance and one incredible coalition later, we delivered. 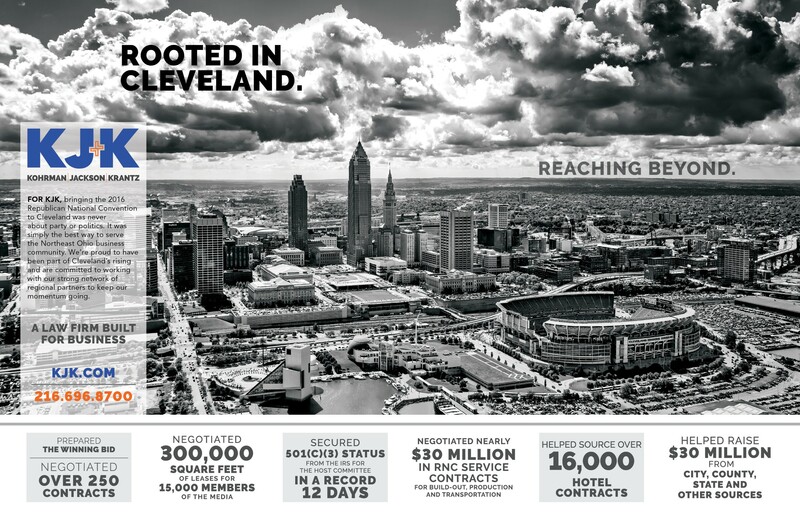 As counsel to Cleveland’s Host Committee, KJK delivered a world-class convention in 2016 and remains dedicated to advancing economic development across Ohio. The summer of 2016 was Cleveland’s time to shine on an international stage. In July, our city got worldwide attention for successfully hosting the Republican National Convention, an event that drew 50,000 visitors and delegates along with 15,000 members of the media to Cleveland. This achievement for the city was the culmination of 10 years of work by KJK attorneys to help bring the event to town and pull it off without a hitch. Ten years of KJK support. KJK’s involvement in bringing a national political convention to Cleveland began back in 2006, when Jon Pinney was asked by Mayor Frank G. Jackson to help the city prepare a bid to host the 2008 Republican National Convention. KJK had counted the City of Cleveland and Cuyahoga County among its longtime clients, and was a trusted part of the city’s strategic team. “Our firm has been a trusted part of the city’s strategic team for years, and we were eager to help when this opportunity arose,” says Pinney. While the city didn’t have the hotel capacity or other infrastructure to earn the convention at that time, KJK was part of helping the city prepare another bid for the 2012 Democratic National Convention, for which Cleveland came in second to Charlotte. Over the years, KJK attorneys meticulously documented every detail of these previous bids and the actions the winning cities had taken. As the city improved its competitiveness by building the Huntington Convention Center, adding thousands of additional hotel rooms and revitalizing the downtown, KJK never stopped preparing for the day that Cleveland would get another shot at hosting a political convention. The bid that sealed the deal. 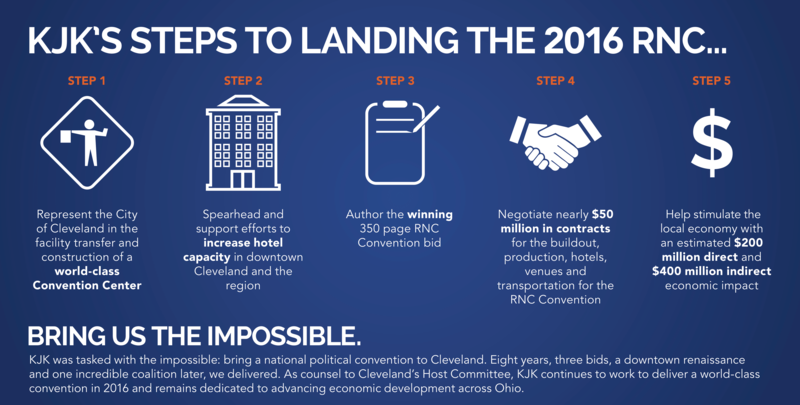 That opportunity came in 2014, when Cleveland got the chance to submit bids for both the Republican and Democratic National Committees to host their respective 2016 convention. The KJK team, led by Pinney, was selected to prepare the bids, which was finally a chance to put eight years of research, documentation and preparation to work in showcasing everything Cleveland had to offer. A total of 10 KJK attorneys and staff members worked around the clock to finalize the 347-page proposal under a tight deadline. The document addressed every detail of nearly 50 aspects of the event, including infrastructure, telecommunications capabilities, hotel capacity, fundraising efforts and more. The effort totaled more than 1,000 hours of work and produced a bid that far outshone those of its competitive cities. A record-breaking 501(c)(3) application. Before the bid could be submitted, the city was required to create a 501(c)(3) charitable organization that would lead the bidding process and become the Republican National Committee’s local liaison. But the process of receiving approval from the Internal Revenue Service for a 501(c)(3) application is notoriously slow, which would have added additional delay to the bidding process. But the application that KJK submitted to form the Cleveland 2016 Host Committee received IRS approval in only 12 days. Hundreds of city-wide contracts. After many months of vetting, presentations, meetings, site visits and more, the Cleveland 2016 Host Committee got the news on July 8, 2015, that Cleveland had been chosen as the host city of the 2016 Republican National Convention. In the halls of KJK and among the public-private partnership who’d worked so tirelessly to make that day happen, the reaction was one of jubilation — the city would finally get the opportunity to showcase to the world everything that’s great about Cleveland. For the KJK team, that started with negotiating hundreds of contracts related to the event. In all, the firm negotiated over 250 contracts related to the event. The firm negotiated nearly $30 million in service contracts for build-out, production and transportation, as well as 300,000 square feet of leases for the 15,000 members of the media that would be in town to cover the event. KJK attorneys also helped source 16,000 hotel contracts throughout Northeast Ohio. Continued service to the Cleveland 2016 Host Committee. As the event approached, planning and execution of the logistics related to the convention itself was largely the purview of the Republican National Committee. But the work of the Cleveland 2016 Host Committee lasted right up until the final balloon fell on the close of the convention and even beyond. Pinney served as general counsel, secretary and treasurer of the Host Committee, overseeing even the most minute legal and fiduciary matters related to the event. Partnerships for the future. Cleveland’s successful effort to earn and execute the 2016 Republican National Convention has been called by many one of the greatest public-private partnerships in our city’s history. KJK’s efforts joined with those of city and county government, non-profits, corporations and other organizations to make this achievement possible. Those partnerships continue to this day, as KJK works alongside our region’s civic leaders to revitalize and promote Cleveland and Northeast Ohio.